Making an aquarium with glued glass is not the exclusive domain of professionals; these days it is also an option for hobbyists. The crucial factor is the care taken in the operation, along with a good organization of the work plan and respect for the sequence of the operation. It is advisable to practice first with a small rearing tank or hospital tank before taking the plunge and building a large aquarium. Hanging out in aquarium clubs can be useful, as it will give you a chance to meet experienced aquarists who can provide advice or give you a hand when you come to glue your first aquarium. 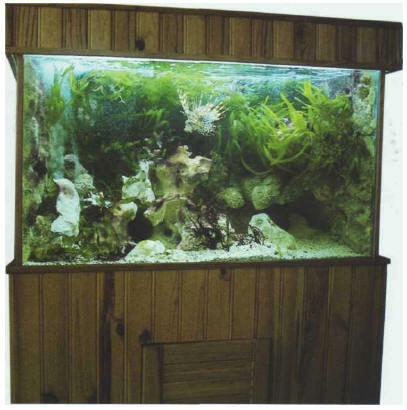 Marine tank built into a wooden closet, made by an aquarist. 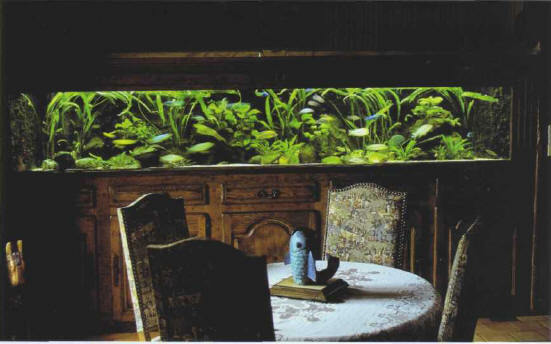 The fundamental material for your aquarium, the element which underpins its existence, is obviously glass. It can be cut to measure in glass merchants or do-it-yourself stores. This operation must be performed correctly, as any slight mistake in the cutting can have serious consequences, especially if the corners are not perfectly square. Tank 3.7 m long, reconstituting the biotope of Lake Malawi. The calculation of the dimensions of the panes must therefore be made with care, and do not forget to take into account the thickness of both the glass and the layer of glue (around 0.5 cm). 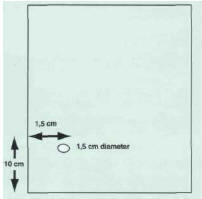 The table below gives you the dimensions of the glass required for two tanks of different volumes. You need a base, two small sides, the front, and the back. There are also provisions for longitudinal reinforcements, which prevent the glass panes from curving due to the weight of water and support the two-section lid. In larger tanks, where the length is equal to or greater than 1 meter, one or sometimesseveral lateral reinforcements are also required to consolidate the unit. Offcuts of glass can be used as pegs for lifting off the lids. After the cutting, remember to ask for the edges to be sanded down lightly, to avoid any unfortunate accidents from splinters or sharp edges. We have chosen one tank of 96 liters and another of 200 liters (the gross volume in both cases) that can easily be built by two people. Do not forget to cut a piece off a corner of each section of the lid and have some pegs (around 2 x 5 cm) ready to use as handles. 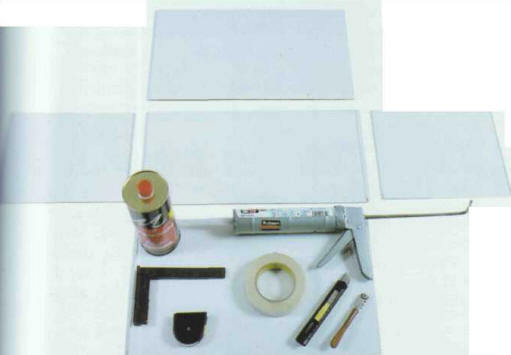 A good glue is needed for sticking the glass walls together effectively: transparent silicone glue for this purpose is available. When exposed to the air it hardens to form a watertight join. The speed of hardening depends on temperature, so special care must be taken in summer. 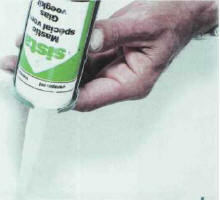 At a temperature of 19-20°C, the glue stays soft for around 3 minutes, which allows time for working. The hardening is sensitive to the touch for 1 or 2 hours afterwards, and is complete in 48 hours. Squeezing the silicone glue onto a sheet of glass. You are advised to be very careful when handling the glue. If you happen to spill or smear some, a dried run-off on a smooth surface can be easily scraped off with a cutter. It is a lot more difficult if clothing becomes impregnated with it. Above all, make sure not to rub your eyes when handling it and, in the event of any accident, consult a doctor immediately. This glue gives off a characteristic vinegary smell which disappears after a little while. It keeps well if the tube is closed with its original cap and stored in a cool, dark, dry place. set square and tape measure. When you have assembled all the necessary materials, you are ready to go on to the construction. Prepare a work surface large enough to allow you to spread out the panes and move around freely. It is advisable to get somebody to help you by holding the panes. To work efficiently, you must be able to spread the panes out on a sufficiently large work surface. 38.3 x 48 cm for the 200 liter tank. four strips of glass intended to hold the filtering material (3 cm wide and 38 cm long for the 96 liter tank; 48 cm long for the 200 liter tank). Panel dividing off the box filter. 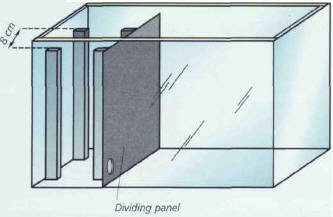 These elements must be mounted in accordance with the diagram below (if the filter is to be on the left of the aquarium), with the glass strips in pairs facing each other. They must not be more than 8 cm apart. The distance between the perforated panel and the closest side is 8 cm for the 96 liter tank and 10 cm for the 200 liter one. Note that the box filter is slightly lower than the main tank, to allow the water to circulate. ШЕФФЕР (Schoffer) Петер (до 1430 - ок . 1503), немецкий типограф и издатель, ученик И. Гутенберга. В 1457 в Майнце у И. Фуста напечатал "Псалтырь", в которой впервые типографским способом воспроизвел орнаментику и применил многокрасочную печать, поместил сигнет. В 1466 или 1467 основал собственную фирму. Выпустил ок. 250 изданий.